W39 was supposed to be one of the destinations in our cafe hop in September. Due to the lack of time, we shelved the idea of visiting this bistro until Sunday. The inviting yellow and blue exterior of W39. 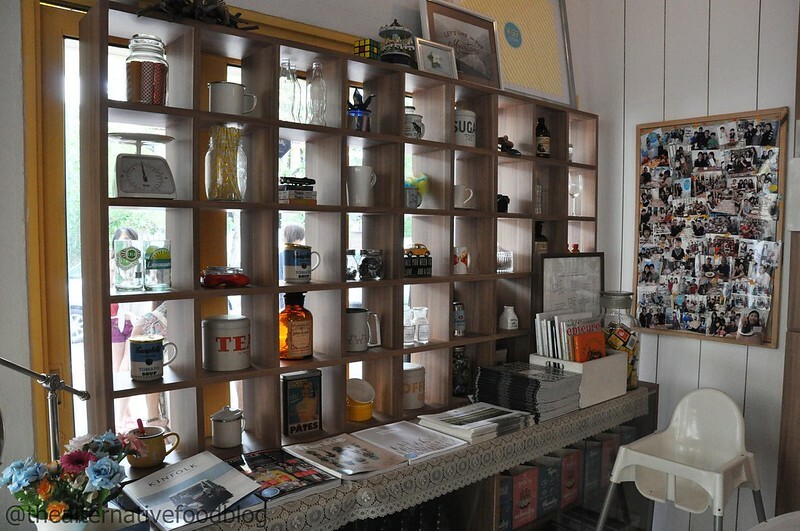 Tucked at the corner of a row of shophouses along Jalan Mas Puteh, W39 reminds me of Strangers’ Reunion (click on the link for our review of the great cafe), with its simple and rustic furnishing. As it was a Sunday, the bistro was crowded when we arrived at 1.30pm. We were lucky (again) and we were given a table within five minutes of leaving our names on the waiting list. My advise is that if you are planning to visit W39 this weekend, do give them a call and make a reservation. The bistro is well-lighted as the floor-to-ceiling windows let natural light in. Indoors, there is a large bench that can seat about 8-10 people at the entrance which is great for a family brunch or a classmates’ reunion. 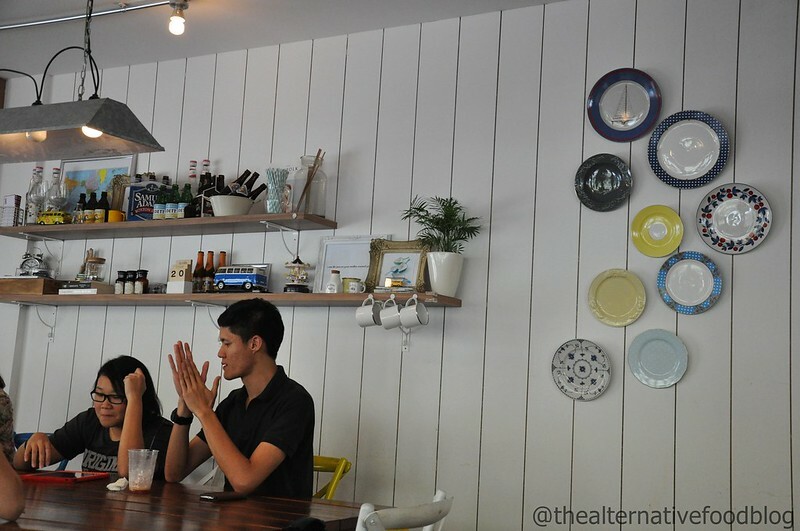 There are also about 7-8 smaller tables to cater to smaller groups of diners. W39 also has outdoor seating and each table outside can seat large groups of 6-8 as well. The interior is small, and the smaller tables are very close to each other. Thus, if you prefer to enjoy your coffee and cake in a quieter environment, you may want to visit W39 during non-peak hours. 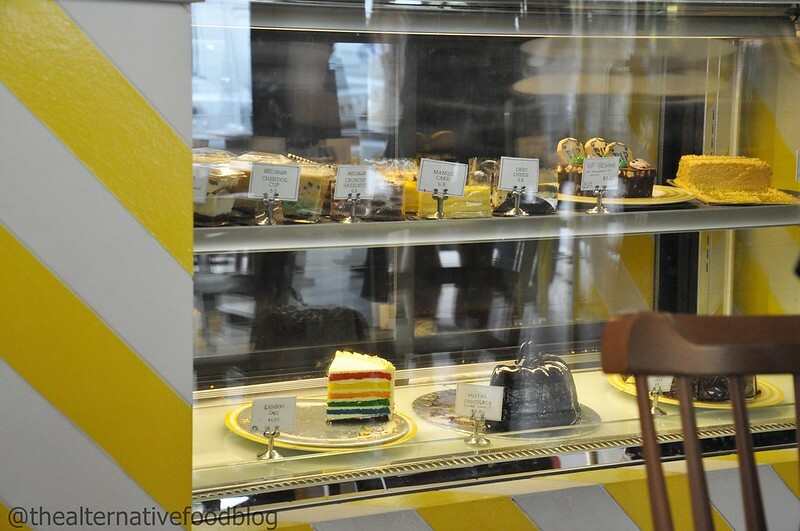 We checked out the cake display while waiting for our orders and we learned from the staff that their cakes are baked in their own external kitchen and delivered to the bistro daily. The cakes available that day included Rainbow cake, and their mini Halloween inspired cakelets. Since we were scheduled to meet the amazing ladies behind the charity bake sale in an hour’s time, we decided to skip the cakes. Since the bistro is not halal-certified, Shereen only ordered an iced latte, thus leaving the task of food tasting to me. I ordered my usual cappuccino, an appetiser of baked portobello mushroom with balsamic reduction, and eggs benedict. There’s free WIFI for those of us who can’t live without our Internet connection! Before I begin reviewing the food, I thought I would share with my fellow vegetarian friends and readers that there are not many vegetarian options available on the menu. The dishes that lacto-ovo vegetarians, like myself, can order are only the baked portobello mushroom and the pancakes. However, if you wish to try the other dishes on the menu, you may have to ask for a special order. 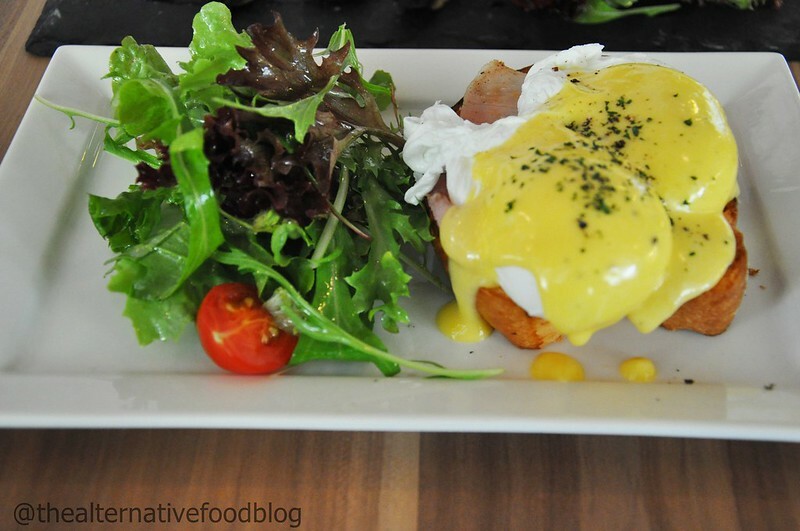 Originally, when I chose to order the eggs benedict, I ordered it under the assumption that it was safe for a lacto-ovo vegetarian like me as there was no meat stated on the menu. However, when my order arrived, the eggs benedict was served with ham, so I had to remove the pieces of meat from my plate. A helpful tip would be to just double check with the staff about the inclusion of meat in the dishes, especially if you have certain dietary requirements. 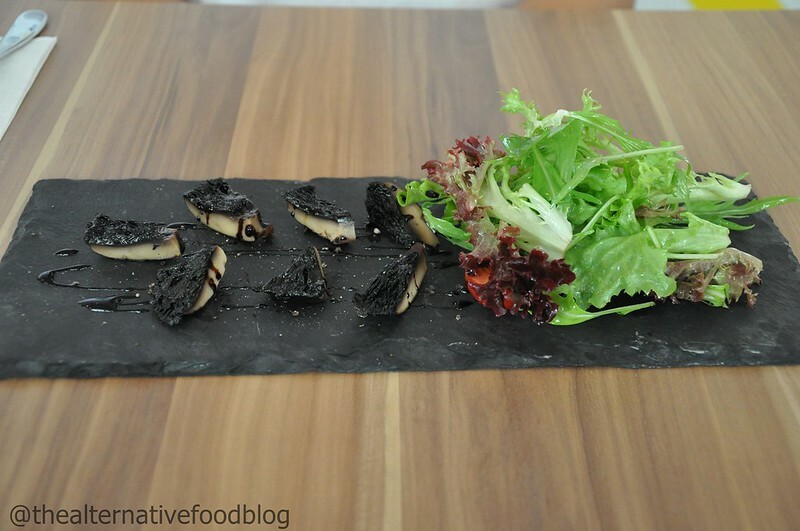 First, let’s talk about the baked portobello mushroom with balsamic reduction (SGD 10.00). The appetiser was served on a fancy ‘slate’ but I was slightly disappointed because I was expecting a beefier dish, like the portobello appetisers I have had at Original Sin and 7 Sensations. As you can see from the picture, there was only one portobello mushroom served and it was cut into tiny pieces. Personally, I think that it is too pricey for a small piece of portobello mushroom, especially when compared to the servings at Original Sin and 7 Sensations. Of course, the latter two establishments cater to vegetarians, so they are most probably aware that the mushrooms have to be beefy since it is one of a meat-substitute for vegetarians. Serving size aside, the portobello mushroom tasted fresh, and the balsamic reduction was well prepared, not overly sour or tangy, and had a slightly sweet aftertaste. The balsamic reduction definitely made up for the small serving. 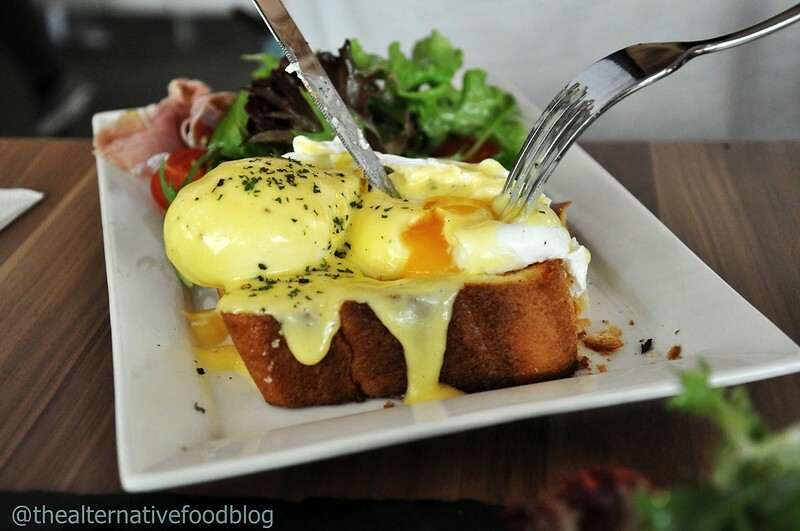 I also ordered eggs benedict (SGD 9.00). As I mentioned earlier, there was ham in the dish and I had to remove it, so do remember to indicate to the staff that you want a special order. I liked the buttery brioche underneath the eggs. It was toasted to perfection, and I loved the savoury taste. In fact, I prefer this toast to that served at Penny University. As for the eggs, I felt that it was not fresh as there was a raw taste in the yolks but otherwise, they were poached beautifully. 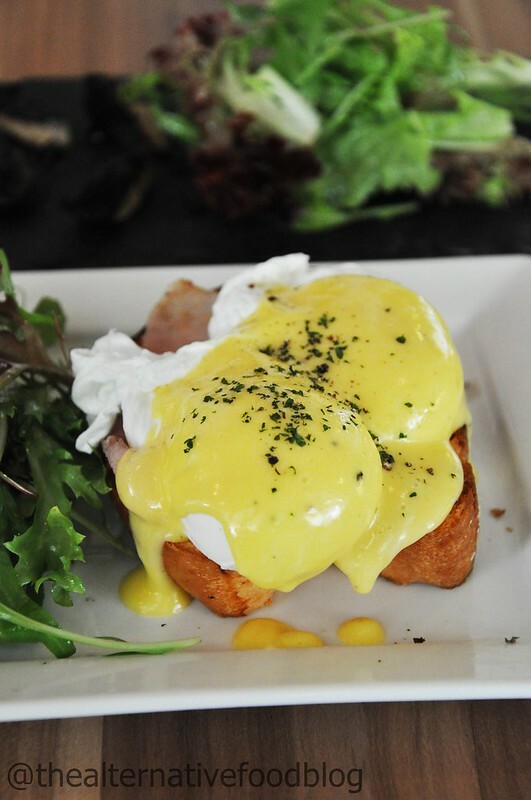 The Hollandaise sauce was not as strong as the sauce from Penny University but if you prefer a milder taste, you may like this egg benedict. I also liked the sweet-sour dressing on the salad that was served with the mushroom and the eggs benedict. Though I don’t know what exactly was included in the dressing, I liked the addition of the honey which gave it a nice sweetness. The salad was a good accompaniment to the entire dish. Nothing makes breakfast better than a good cup of coffee in my opinion and W39 did not disappoint with its coffee. I liked my cappuccino (SGD 4.50) as it had a robust aroma, and it did not have that sourish aftertaste that we sometimes taste in coffee. It does not taste as strong as the cappuccino from La Marelle (but then, we haven’t been able to find a coffee that matches those brewed at La Marelle). I do wish it was less milky but otherwise, it was good coffee. Shereen enjoyed her iced latte (SGD 5.50). According to her, the iced latte was milky and strong but not overly bitter, which was great for her because she doesn’t add sugar to her coffee. Would we be back to W39 again? Maybe not in the near future since it is not halal-certified and there are limited vegetarian options on the menu. Perhaps we will be back to try their cakes if we happen to find ourselves in the vicinity. It is times like this that make us all the more determined to review more eateries and cafes so that our fellow Muslim and vegetarian readers can make informed choices about where to dine. 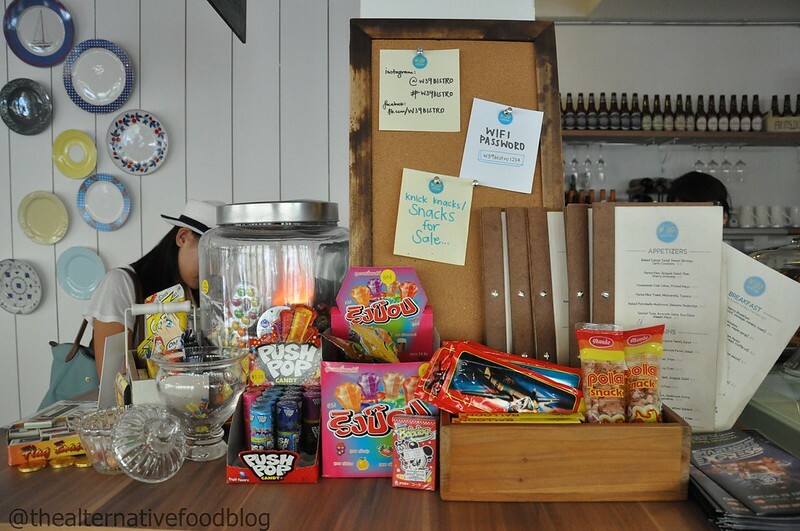 Hopefully, we will see more cafes that cater to people with different dietary requirements. So if you are planning on brunch this weekend, you may want to visit W39. 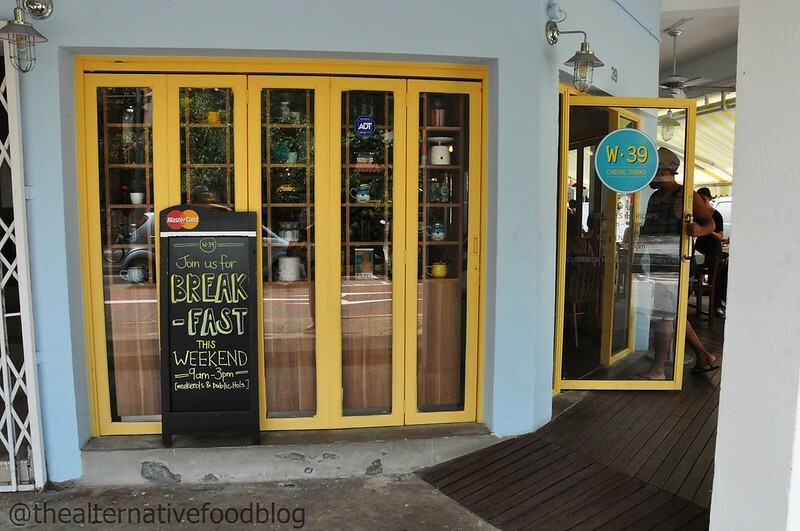 They serve breakfast from 9am -3pm on weekends and Public Holidays. To be safe, do be sure to call and make a reservation with them. *Closed on Mondays except Public Holidays. Vegetarian Options: There are limited vegetarian options. Our verdict? ♡ ♡ ♡ ♡ / ♡ ♡ ♡ ♡ ♡ (2 out of 5 hearts).